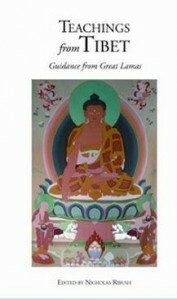 Teachings from Tibet by Dalai Lama and other Tibetan Lamas. In the 1970s and ‘80s most of the great Tibetan lamas left Tibet. They continued to teach, mainly in India. Many of the teachings in this book were given at Tushita Mahayana Meditation Center, New Delhi, by lamas in exile. Two of His Holiness the Dalai Lama’s teachings are also present in this book, the chapters Seeking an inner Refuge and The Eight Verses of Thought Transformation. Two of His Holiness the Dalai Lama’s teachings are present in this book, the chapters Seeking an inner Refuge and The Eight Verses of Thought Transformation.